275 - 300 sq. ft. This vintage charmer contains an amazing list of amenities and day-to-day essentials. 1940 N. Lincoln is a seven-story, elevator building located in the heart of one of the most desirable neighborhoods in Chicago, Old Town / Lincoln Park. Soak in this gorgeous skyline city views while relaxing on the rooftop sundeck. This will quickly become your favorite spot to retreat to after work, with cocktail in hand. Other perks include on-site laundry room, high speed fiber optic cable and internet, package receiving room and on-site maintenance engineer to tend to your every need. Planned Property Management is also only ever a phone call away with our 24/7 customer hotline. Residents also enjoy a resident referral program and no pet fees for cats! 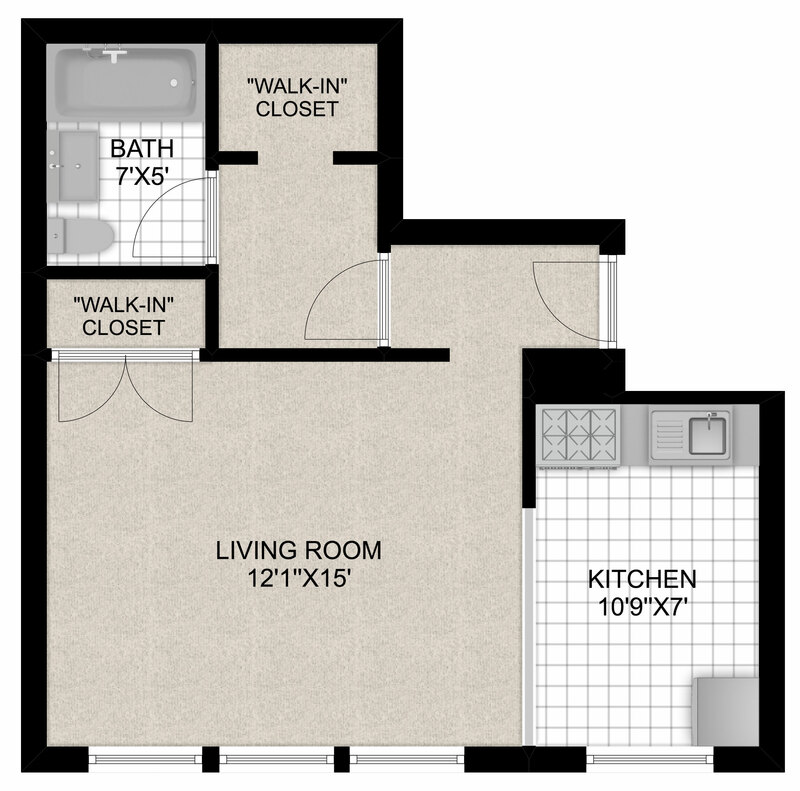 Studios are available, all with expansive, sunny floor plans. The designer plank flooring and charming vintage touches make each unit move-in ready. The modern kitchens and bathrooms lend a hand in quickly making your new apartment a home of your very own. Smack dab in the middle of the friendly, upscale neighborhood of Lincoln Park, you enjoy easy access to the best bars and restaurants in town. Delicious restaurants, friendly cafes, grocery stores, movie theaters, and plenty of public transportation options makes this part of town appealing to all. Parks are everywhere you look in Lincoln Park. Oz Park is a lovely jewel of green space that celebrates all things “Wizard of Oz.” Stroll around the tree-lined streets and take in the sites of this peaceful, yet exciting neighborhood. And of course, the biggest park of all, Lincoln Park is less than a block away. Welcome to your new backyard! You’ll love it here. Lincoln Park provides its residents with everything they need within walking distance. Every day errands can easily be completed without a car. When you need to travel further afield, there are plenty of bus lines outside of your door, servicing both east-west, and north-south. Biking is easy up here with plenty of bike lanes and no hills of course!